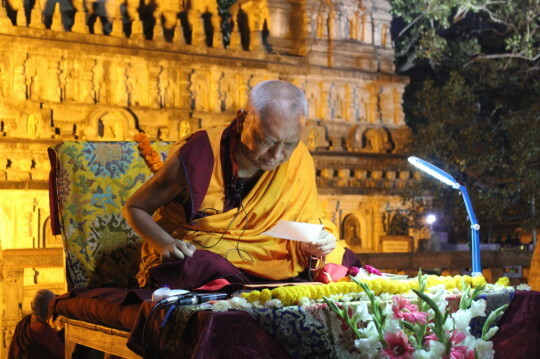 Lama Zopa Rinpoche giving the oral transmission of the Vajra Cutter Sutra at the Mahabodhi Stupa, Bodhgaya, India, March 2015. Photo by Ven. Lobsang Sherab. “When you go to bed, when you go to sleep … this is what you are about to do when you get back to your room. Or maybe here! Maybe, if I continue a little bit, then maybe here!” Lama Zopa Rinpoche joked during the 41st Kopan course in December 2008. “It is mentioned by Lama Tsongkhapa that when you go to bed, first wash your feet. I think washing the feet helps the mind to be fresh, to be not heavy, not sleepy, where you can’t wake up. The mind is clearer. “Then, you go to bed in the position when the Buddha was passing away, on the right side in the position of a lion laying down, not sleeping flat on the bed. Your two legs are stretched out, the left leg put on the right, laying down in the position of a snow lion. It is said that with this method you wake up easily, so as to not waste your life, to not have a very drowsy, very heavy sleep. It is very easy to wake up to do practice. “When you go to bed, think of light. Generate virtuous thoughts until you fall asleep. Generate virtuous thoughts in meditation. “Also, when you’re about to fall sleep, you have to have the intention, the motivation, not to be overwhelmed by sleep, and without the delay of getting up. That is mentioned in the teachings. It is also mentioned in the teachings that there are three parts of the night: the upper part of the night, the middle part of the night and the lower part of the night. So, for those upper and lower parts of the night, practice Dharma, virtue, don’t sleep. In the middle part of the night, sleep. That also helps with your health. In the early part of the night, practice Dharma, and also in the lower part of the night, in the early morning, get up and do practice. In the middle part, sleep. That way, you don’t waste your life. “For example (I’m not making this definite, I’m just using an example) let’s say you want to get up at four o’clock to begin your practice, to not be overwhelmed by sleep. To be able to get up at that time in the early morning to begin the practice, you have to have that kind of motivation, to wake up at that time, to have that kind of energy, of inspiration. “That’s what mentioned in the lam-rim teachings. It’s said that you should be like a deer living in the forest. It doesn’t have a house and there are many enemies, so when it sleeps, it is a very light sleep, it keeps its ears up. It is a very light sleep because it has to be careful. It’s explained in the teachings like that. It means to not waste your life but instead to get up early in the morning to be able to begin your practice. Lama Zopa Rinpoche gives more advice on sleep yoga (see Lecture 9) in the transcripts of the 41st Kopan course (http://bit.ly/41st-kopan-course), lightly edited by Gordon McDougall and made available by the Lama Yeshe Wisdom Archive. This excerpt was further edited by Mandala for inclusion on FPMT.org.